Latin American bishops met with Pope Benedict in Aparecida, Brazil last month to prepare their next assembly in Havana, Cuba in July. They insisted on preparing a three part report in line with the See Judge Act method that they have followed since their famous Medellin conference in Colombia in 1968. Perhaps this would not be remarkable, except for the fact that the use of the method was apparently a cause of controversy at Aparecida. 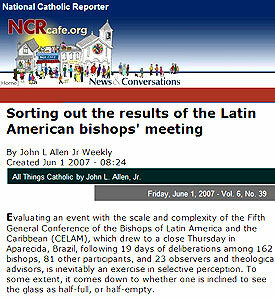 Writing in the National Catholic Reporter, Vatican observer John L Allen linked the use of this methodology to what he described as "a cautious embrace of the core legacy of liberation theology, including the option for the poor, the concept of structural sin, ecclesial base communities, and the See Judge Act method of social discernment". According to Allen, "critics see in the method an implied relativism as if truth can be manufactured by consensus employing the ‘see-judge-act’ process". And yet the Latin American bishops in 1968 and in 2007 were doing nothing more than following a course that Pope John XXIII had outlined for them in his 1961 encyclical, Mater et Magistra in which he described See Judge Act as a method for "the reduction of social principles into practice". First, one reviews the concrete situation; second, one forms a judgment on it in the light of these same principles; third, one decides what in the circumstances can and should be done to implement these principles. In this context, it is perhaps appropriate to consider the origins of this method which will forever be associated with the late Belgian priest, Father (later Cardinal) Joseph Cardijn, founder of the Young Christian Workers (YCW) movement, who actually coined the term See Judge Act. Cardijn himself clearly considered See Judge Act to be a core component of his legacy to the Church. Significantly, in his speech to Vatican II fathers on the schema of the future Declaration on Religious Freedom, Dignitatis Humanae, he described the method as a key means for developing the "interior freedom" that "exists in germ in every human person as a natural gift” but which requires a “long education”. "I have shown confidence in [young people’s] freedom so as to better educate that freedom”, Cardijn told the Council. I helped them to see, judge and act by themselves, by undertaking social and cultural action themselves, freely obeying authorities in order to become adult witnesses of Christ and the Gospel, conscious of being responsible for their sisters and brothers in the whole world. Cardijn’s use of the term “conscious of being responsible”, a phrase that reappears in various guises in nearly all his major speeches, is also highly significant. It is a reference to the definition of democracy promoted by Marc Sangnier’s early 20th century Sillon (Furrow) movement as the form of social organisation that tended “to maximise the civic consciousness and responsibility” of each person. To achieve this, the Sillon also developed a "method of democratic education" carried out in "study circles" that examined "the realities of life". "Every citizen must know the state of the nation; when the situation is bad, he must seek solutions; and lastly, having found the solutions, he must act,” founder Marc Sangnier said outlining the Sillon method in 1899. Marianist Brother Louis Cousin, a 'counselor' of the movement was even more precise in a Sillon manual published in 1906. Drawing on the “social observation” method developed by Frederic Le Play, a mining engineer turned social reformer, Cousin characterised the Sillon’s approach as going beyond "observation" to "consciousness". Whereas LePlay’s method was based on studies by outside social researchers, the Sillon brought together young people in study circles “where no aspect of life would escape notice". Thus, said Cousin, "external observation" was transformed into "consciousness" in what he called the "distinguishing mark of the Sillon". In developing their consciousness-raising method, the Sillon also drew on the work of the Catholic philosopher and Ozanam disciple, Léon Ollé-Laprune, whose major work, Le Prix de la Vie (meaning The Price and/or the Prize of Life), went through fifty editions from its first publication in 1894 until the outbreak of World War II. For Ollé-Laprune, whose students included the pioneer sociologist Emile Durkheim as well as the philosophers, Maurice Blondel and Henri Bergson, life was defined as 'action', as Aristotle had written. Each person, Ollé-Laprune said, must therefore endeavour “to courageously and faithfully look at the principles and the facts in order to see, judge and conclude ever more clearly”. "In order to act well, it is necessary to see and judge well," he wrote in 1896, anticipating the phrase that Cardijn would later make famous. For Ollé-Laprune, the method was important to "avoid pre-judgments and errors" but also in order "to find the consistency to bring people closer and to reunite". In other words, it was a method well adapted to a pluralist modern society founded on a diversity of views. Cardijn also understood See Judge Act in precisely this sense, citing the "peaceful unification of a pluralist world" as his first argument in favour of religious freedom. "Our great task is to unite ourselves with all men of good will to build a more human world together based on 'truth, justice, liberty and love'", he told the Council, quoting Pope John XXIII in Pacem in Terris. In other words, See Judge Act has nothing to do with a relativistic approach to the truth but everything to with a common search for the truth at different levels – facts, values and action – by people of diverse faiths, beliefs and ideologies. Over the last few weeks, the stem cell debate in various Australian states has shown how difficult it is to arrive at agreement on fundamental issues – even among Catholics of presumably good will. With the emergence of a renewed questioning of the role of religion by philosophers like Richard Dawkins and others, issues of 'intellectual' conflict that concerned Ollé-Laprune in the late 19th century are on the rise again. With the fortieth anniversary of Cardijn’s death on 24 July 1967 approaching it may also be time to re-examine the lay apostolate heritage that he did not pioneer but which he joined to the heritage of the whole church. Recent articles by Stefan Gigacz. Stefan, thank you. Just when I thought my brain was going dull and all of my years invoking "See, Judge, Act" were becoming less relevant you have re-energised the essential beauty of the discipline. SEE JUDGE ACT is behaviour as natural to human beings as is walking. For example, a mother who is watching her three year old child playing with other children SEEs the child's behaviour, JUDGEs that behaviour and ACTs at times to encourage the child's acceptable behaviour and guide the child away from what is unacceptable. The mother would probably SEE more of the child's personality and social development expressed in the child's behaviour if she were to read articles on child psychology and sociology, for example; consequently, her JUDGEment (her in depth understanding) of the actions, and consequent understanding of her child may be different; and her ACTing, in turn, may be different. If mother and child are Christians, as the years pass, the mother will help the child understand, in faith, that there is a God dimension to SEE JUDGE ACT. By deeper reflection in the light of liturgy, scripture, sound doctrine and christian living the child comes to SEE: "Life to me is Christ" (Phil. 1:21). "I live now not with my own life but with the life of Christ who lives in me." (Gal 2:20ff). We are all called to SEE with faith, JUDGE in faith; and ACT in faith. Adults acting on SEE JUDGE ACT devote a great amount of time to SEEing, i.e. studying the facts of a situation authentically. I believe that much of the SEEing of decades ago was too superficial. The recently published "The Price of Peace - Just War in the Twenty-First Century" is a good example of the depth of study required. The facts are then considered in the light of all the "ologies" that the individual (or group) can muster: psychology, sociology, theology ....and politics. 'JUDGE'ing calls for reading the signs: signs of sin and signs of grace in the studied event. The signs are then interpreted according to liturgy, scripture, sound doctrine and christian living. Always there will be a process of continuity, discontinuity and transformation involved as any superficial human values involved are confronted by the transformations given them by Jesus of Nazareth. In other words, the Paschal Mystery - our sharing in the great mystery of the Death and Resurrection of Christ - will always confront us, calling us to ongoing conversion in Christ. A human being can be considered as a person-in-relation-to-others, where the "others" are persons and the whole of creation (e.g., environmental isues) as well as the historical events (e.g., the current aboriginal issue) affecting others. It is in and through the quality of these relationships that a person becomes a unique human being. ACTing, therefore, is a response in faith to God, who reveals himself to us in the events of life and in history. It involves personal conversion. It also involves ongoing reflective prayer e.g., relevant "lectio divina" and prayer with others involved in ACTion. It involves public ACTion in encouraging the relevant signs of grace and opposing the relevant signs of sin, which involvement will often be limited to conversation and influencing opinons. (No political party will be in government for long if it is too far ahead or behind popular opinion on important issues.) At times it will involve political ACTion, e.g, demonstrations or other political activity. I think it worthwhile to relate the see, judge, act, technique to the contribution of the late Uruguayan theologian, Juan Luis Segundo, as this is observed, for example, in his Liberation of Theology. There is a potentially deeper level of awareness here, such that any exploitative ideology which can infiltrate theology needs to be undone, so that then useful practical theology (within praxis) can be done. See, Judge, Act is the same as Bernard Lonergan's Transcendental Operations: Be Attentive, Be Intelligent, Be Reasonable and Be Besponsible. In other words pay attention to the facts, make your judgment and verufy it and then act morally upon it. Hardly a relativistic approach or moral cheery picking but a humble submission to the truth demanded numerous conversions. It's been very nice for me to read this article about the See, Judge and Act. It improved my knowledge about YCW. Bless your heart.